Biology professor John Stireman flanked by students in his lab: (left to right) Zach Burington, Dan Davis, Stireman, Karen Pedersen and Tiffany Brown. A strip of masking tape under his name on the office door identifies him as "Lord of the Flies." With a salt-and-pepper beard and countless jungle jaunts under his belt, he's become the Indiana Jones of insects at Wright State. And now, he has a wasp named after him. A newly described species of braconid wasp has been officially christened Ilatha stiremani after Wright State entomologist John Stireman. 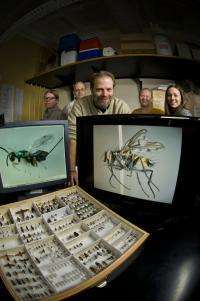 The relatively large, colorful wasp was named in a scientific paper in honor of Stireman for his research help in identifying and providing information on tachinids, a large family of flies. Stireman's role was to examine the pupa—which precedes the adult stage—of flies that were carrying the newly identified parasitic wasp. "I've never had a species named after me before; it is an honor to be recognized in that way. I have friends who have species named after them, so now I feel better," Stireman said with a smile. However, he downplays the honor, saying it is not that unusual for newly identified species of insects to be named after someone and that there continues to be plenty of opportunity. "There are hundreds of new species pinned in drawers in museums, but there are not enough knowledgeable people to look at those things," he said. Don Cipollini, Ph.D., director of Environmental Sciences, said it is a tremendous honor to have one's name immortalized in the scientific name of a species. "John was honored because of his standing as one of the world's experts on tachinid flies, a host for this parasitic wasp," said Cipollini. "It is an honor for Wright State to have such well-respected researchers among its faculty." Stireman has been heavily involved with researchers at other universities in a National Science Foundation funded project to take an inventory of the biodiversity in the Andes Mountains of Ecuador. The project has taken Stireman to Ecuador a half dozen times, working largely in elevations of between 7,000 and 8,000 feet. "We go into these cloud forests that are super-diverse—really diverse plant communities, really diverse insect communities—but we really know nothing about most of the species," he said. "A lot of the species are undescribed. Even the ones that we do know exist, we don't know anything about them—what they eat, what eats them. You can use that information to understand the whole food web of an ecosystem." Stireman's love of biology and insects developed as he was growing up in Utah. His father studied mosquitoes as a graduate student, and Stireman spent a lot of time hiking and backpacking. "You're out there and you're seeing things and you want to know what they are," he said. Stireman majored in biology at the University of Utah and obtained his doctorate in ecology and evolutionary biology at the University of Arizona, where he worked on an independent project that focused on flies. He did post doctorate work at Tulane and Iowa State universities, then landed a teaching job at Wright State in 2005. The visual evidence of Stireman's interest in biology spills from his office into the lobby, where Nature magazines fan out and a poster of the birds of Ecuador is pinned to the wall. Stireman is passionate about the importance of identifying different species of insects, saying fewer than half the species are known. "Knowing about a new species will probably not cure cancer or solve world hunger. But it could," he said. Stireman noted that study of Drosophila melanogaster, the common fruit fly, has led to a much deeper knowledge about genetics and physiology. And he said parasitic insects, for example, could be used to kill crop pests without using pesticides. "Every species has a lesson that it can teach us," he said.